Empaths play an important role at this time in humanity’s evolution, but it can be said that the gift of the Empath is both a blessing and a curse. So how do we connect with our sensitivities without being overwhelmed by them? Join us for a mind-expanding conversation as we learn the ins and outs of the empath with Ascension Portal, Lisa Martin Naimi. 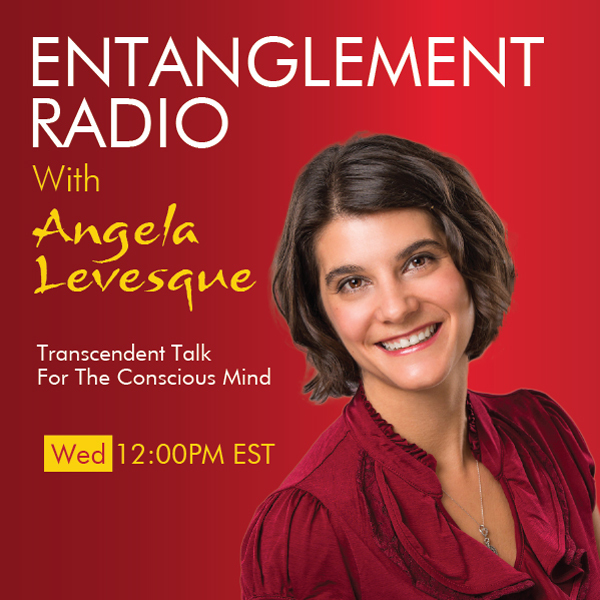 Join Angela Levesque for her last show of the year as she discusses her vision for the show and humanity in 2016. Angela will help you set your spritiual compass for the New Year, by exploring how to set intnetions, experience goals and actions steps that can help you to develop and grow physically, emotionally and spiritually. Join us for a fun and playful show as we look forward to the possibilities and potential of 2016 with Angela Levesque. We know that Jesus was revolutionary, but he was evolutionary as well. In her new book, The Evolutionary Testament of Co-Creation, Barbara Marx Hubbard takes an in-depth examination of the Gospels and discovers that Jesus’ teachings provide us with solutions for our current challenges. She believes that each of us is endowed with ‘Christ-like’ powers that can help us to collectively transform our planet and create a positive future for everyone. Join us for an important and transformational conversation with renowned, author, teacher and visionary Barbara Marx Hubbard. Barbara Marx Hubbard has been called “the voice for conscious evolution” by Deepak Chopra. As the subject of Neale Donald Walsch’s book, The Mother of Invention, many would agree Barbara is the world’s foremost global ambassador for conscious change. At heart Barbara Marx Hubbard is a visionary, a social innovator. She thinks from an evolutionary perspective and believes that global change happens when we work collectively and selflessly for the greater good. She realizes that the lessons of evolution teach us that problems are evolutionary drivers and that crises precede transformation. This gives us a new way of seeing and responding to our global situation. A prolific author and educator, Barbara has written seven books on social and planetary evolution. She has produced, hosted, and contributed to countless documentaries seen by millions of people around the world. In conjunction with the Shift Network, Barbara co-produced the worldwide “Birth 2012” multi-media event that was seen as a historic turning point in exposing the social, spiritual, scientific, and technological potential in humanity. In 1984 her name was placed in nomination for the Vice Presidency of the United States on the Democratic Party ticket. She called for the creation of a Peace Room to scan for, map, connect and communicate what is working in America and all around the world. She also co-chaired a number of Soviet-American Citizen Summits, introducing a new concept called “SYNCON” to foster synergistic convergence between opposing groups. In addition she co-founded the World Future Society, and the Association for Global New Thought. Barbara Marx Hubbard is not an idealist, nor does she believe that social and planetary change is simple. But she does believe that humanity has the tools, fortitude, and resolve to take the leap towards conscious evolution. What happens when we start to acknowledge the small miracles in our everyday life? How do move into the miracle flow to live a life of abundance and gratitude? Sora Garrett believes that “The biggest miracle is when we are each living in Shining Connection with our Soul’s highest Purpose”. Join us for a heartwarming conversation with the “Miracle Lady’ Sora Garrett on Entanglement Radio. Sora Garrett is a creative visionary, writer, spiritual mentor & catalyst for a more compassionate and collaborative world. Her favorite title (other than “Nana” to her 7 year old grandson) is “The Miracle Lady” as she’s called by some of her Boise friends. She loves shining light on the small miracles that surround us every day. She also believes the biggest miracle is when we are each living in Shining Connection with our Soul’s highest Purpose by joyfully & generously sharing our natural gifts. Sora’s new book, The Miracle Keys, is about opening your heart to a life of deep happiness and lasting abundance. Part conversation with an Angel, part conversation with Sora’s heart, it’s a heartwarming story that has layers of truth … and while it appears simple on the surface, it’s a book you’ll want to read more than once. Through her ShineConnection.net website, Sora invites you to join the Miracle Playground & participate in an innovative grassroots giving circle that celebrates & funds everyday hero-beacons as a way to shine light on the good & refuel the miracle workers. Ho’oponopono is an ancient technique of forgiveness and reconciliation. It has been used to heal relationships and heal the karmic bondages that keep people stuck. Some describe it as a form of radical responsibility for not only your personal actions but also the actions of everyone. Join us for an expanding conversation on the healing of the whole with Dr. Bruno Roque Cignacco (PhD). Dr. Bruno Roque Cignacco (PhD) studied Metaphysics for more than 15 Years. He is the author of the book “How to Become a Miracle-Worker with your Life: Steps to use the almighty ancient technique of Ho’oponopono” published in 2015 by 0-Books John Hunt Publishing. He is the author of the book How to Manifest Money Effortlessly: Techniques to be more prosperous. This book was published by 0-Books (John Hunt Publishing) in 2013. He is also the author of several business books. In a world made of vibration, it would make sense that the earth has provided us with beautiful treasures that can be used to bring balance and harmony to the body. How can we use crystals to clear and balance the chakras, subtle energy bodies and to raise kundalini? Join us for a heart-opening conversation on the healing power of crystals with mind/body/spirit author, Judy Hall. Can we transfer energy from one person to another? Is there a way to promote interconnectivity so we can experience authenticity, awareness and bliss simply through the hands and intention of the Oneness Blessing giver? A Oneness Blessing or Deeksha, can shift the brain in subtle yet powerful ways to help the receiver open the heart, quiet the mind and let go of resistance. Join us for an inspiring conversation on how we can change the world one blessing at a time with Paula Rosenfeld. How do we connect with our divine and perfect self? How do we live life as the multidimensional beings that we are? Aleya Dao gives practical guidance on how we can realize our full potential and open ourselves up to the energetic resources offered by a multidimensional perspective. Aleya is a sound healer, energetic practitioner, Minister in the state of California, Doctor of Oriental Medicine in New Mexico, and a Licensed Acupuncturist in Colorado. She has been an alternative healer for 20 years. Aleya graduated from Lewis and Clark University in Portland, Oregon and earned her Master’s Degree in Oriental Medicine from The Southwest Acupuncture School in Santa Fe, New Mexico. She practiced in Telluride, Colorado for 7 years before moving to Santa Barbara, California where she serves an international clientele as a spiritual guide and sound healer. In 2001 Aleya had an enlightenment experience, which enabled her to perceive other realms, hear the angelic beings, and increased her empathic and clairvoyant abilities. Sounds True released her Light Body Healing Album in August of 2014. Her first Book, Seven Cups of Consciousness: Change Your Life by Connecting to the Higher Realms with New World Library will be released September 2015. What’s the difference between a psychic, intuitive and medium? These words are often used interchangeably, but is that appropriate? Can we learn about our own gifts by understanding the difference between them? Join us for a playful discussion on the makings of a mystic and how to develop the gifts that lie within each one of us with Hilde Pols. Growing up in four countries, speaking three languages and having had the fortune of visiting and interacting with many more cultures, Hilde* considers herself an Earthian, striving to celebrate and unite diversity. Her studies in musicology and linguistics furthered her interest in transcending boundaries. She continued her education to certify as a meditation instructor, Dorn&Breuss** practitioner, and explores Eastern philosophy and medicine. Her spiritual upbringing naturally led to her practice as spiritual healer and medium following the British tradition. Due to this varied background in spiritualism and health she co-founded the German based In Kaleidoskop, to support people in their health and spiritual journeys, as well as to further the international learning of spiritual healing and mediumship. Her varied interests and training flow into her work as instrumental teacher and health coach. Her music students explore meditation techniques and postural understanding whilst she encourages her health clients to embrace their artistic self and capabilities. All the while she encourages individuals to surpass words and visualization – our boundaries –, and to just dive in, to experience the art of life. How many of us have woken up one day wondering how did we get so lost? Where did all the time go? Mark Flory knows what it’s like to be out wandering the abyss and just going through the motions of daily life. But because of this experience, he went on a journey to rediscover who he is and now assists others in doing the same. Join us for an inspirational conversation on how we can rediscover our authentic selves and live a life of passion with Mark Flory. Mark Flory is a Spiritual Interpreter and Life Architect that began bringing clarity to people’s lives in 2007. Mark has his degree in Holistic Wellness with a major in Mind/Body Transformational Psychology. He is also a certified life coach and hypnotherapist. Mark is currently working on his latest program Rediscover You which helps people gain clarity about themselves by rediscovering their values and beliefs from the inside rather than validating themselves from the outside world.